FANALYTICS: Matthew Berry's "Fantasy Life"
This grand game of ours—do you play it for fun or do you play it to win? This is not an easy question to answer. There is a school of thought that says you can't have it both ways. If you want to play for fun, you can stock up your fantasy team with home-town players, make trades just for the sake of making them and take occasional sideways glances at the standings. If you want to play to win, there are no short-cuts, no emotional ties and no mercy. I originally built this BaseballHQ.com site for the latter group. Our articles were based on objective analysis and were deliberately devoid of emotion. Fantasy leaguers came here to learn how to win. If you wanted to engage in trash talk, dream up the funniest team names or avoid thinking too much, there were 5,000 other places to visit. But then we started running the First Pitch conferences. As much as attendees came for the information, it quickly became apparent that there was something important missing—the fun. So I started instructing our speakers that their presentations had to be 50% information and 50% theater. I told them that attendees who were only concerned with information could just as well visit our websites; they didn't need to come to a conference. The conference venue required that there be theater. The experience had to be interactive and fun. Over the years, we've had some excellent speakers provide that theater at First Pitch, but the person who originally set the bar—and pretty high—was Matthew Berry. About a decade ago, Matthew was writing for Rotoworld.com and looking for ways to increase his footprint in the industry. He was persistent in that quest, to the point of finding a way to participate in our 2003 Arizona event even though he was not officially a part of the program. But he was a huge hit. Unsurprisingly, he was also a bit polarizing. As funny and engaging as he was as a speaker, he littered his presentations with colorful language, which generated some angry comments on our surveys. I kept inviting him back anyway. He was the theater that the program sorely needed. 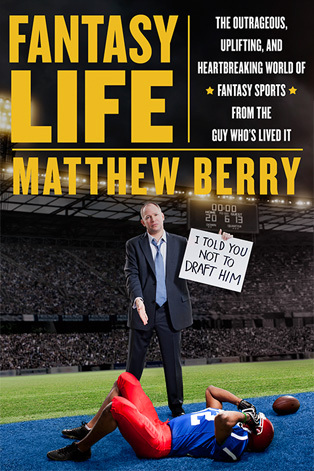 And since joining ESPN, Matthew Berry has now become the theater that the fantasy sports industry sorely needed. A few weeks ago, he sent me an advance copy of his new book, "Fantasy Life: The Outrageous, Uplifting, and Heartbreaking World of Fantasy Sports from the Guy Who's Lived It," which goes on sale next month. One would think that a book of this type could not be described as "an important work" but in many ways it is. We participate in a multi-billion dollar industry and play a game that, for many of us, overtakes our lives. Fantasy sports is no longer just a hobby; it is a culture. Sam Walker's 2004 book, "Fantasyland," gave us a limited glimpse of how one outsider might become a part of this community. In "Fantasy Life," Matthew pulls back the covers completely to show how massive the community really is and how the Fantasyland experience wasn't nearly as warped as it could have been. Matthew describes his journey from Teenage Fantasy Geek, to Lowly Hollywood Screenwriter, to King of the Fantasy Geeks in a circle-of-life narrative built upon dozens of stories. Each group of stories comes from his readers and his own experiences, and is tied together by different elements of the fantasy game—rules, the draft, trades, playoffs. The stories describe innovative dispute resolutions, ingenious ways to cheat and some extreme measures some people have taken to make it to their drafts. There are stories about tattoos, college funds, male strip clubs and repo men. Matthew tells us how fantasy has oozed its way into politics and religion. And if you want to know the real reason why the Marlins stink, it's in Chapter 6. Admittedly, the overwhelming majority of stories are football related, but you could change many of the names and not lose any context. Perhaps the biggest difference in fantasy football is that more women play that game. That makes for some interesting new options for marketable commodities in trade negotiations. Okay, maybe not that new. The stories are a deft exhibition of pacing and payoff, something that Matthew has always been good at. They run the gamut from hilarious to heart-warming. His autobiographical snippets make for some of the more engaging sections of the book, for me anyway. They provide a more grounded tone and help the reader see behind the public persona. The late-chapter description of how fantasy transformed his own blended family was an incredibly touching story. The book is a fun, quick read, though it is not without a few minor flaws. While he interweaves his personal saga with those of his readers, the transitions sometimes seem forced. On several occasions, he starts a personal story, only to leave us hanging as he segues into something else. My need for structure and organization might have presented all the stories independently rather than as a continuum, but that's just me. The book captures who we are at the extremes, but it is still important because it provides the reminder that, beyond all the BABIPs and LIMAs, this is a game that is supposed to be fun. So, if nothing else, "Fantasy Life" answers the question of "play to win?" or "play for fun?" It's both. You can have it all and often at the same time. But it's not always pretty. More information about Fantasy Life and pre-ordering details.